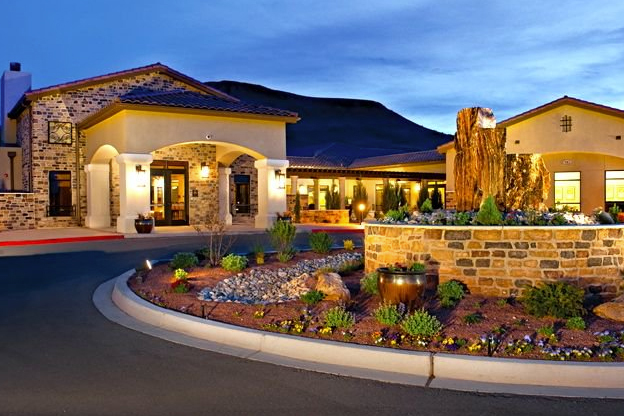 Jubilee at Los Lunas in New Mexico offers active adults everything they need in retirement. This community offers three home collections to choose from: Choice by Avalon, Emerald by Jenamar, and Diamond by Jenamar. The Choice Series includes eight floor plans ranging from 1,405 to 2,972 square feet of living space. Inside are two or three bedrooms, two to three bathrooms, and two or two-and-a-half car garages. The Emerald Series has six floor plans which include 1,143 to 1,949 square feet, two or three bedrooms, two bathrooms, and one-and-a-half or two-car garages. The Diamond Collection has 1,405 to 2,872 square feet of living space, two or three bedrooms, two to three bathrooms, and two or two-and-a-half car-garages. Each home includes features like granite countertops, walk-in closets, first-floor master suites, and optional covered patios. Jubilee at Los Lunas features The Villa, a sparkling 12,000 square-foot clubhouse at the center of the community. Included in The Villa is a gathering room, fitness center, aerobics and dance studio, locker rooms, and an indoor lap pool. Also inside are hobby and game rooms, a classroom, library, computers, billiards room, bar, and catering kitchen. There’s just as much to enjoy outside the clubhouse, including a junior Olympic-sized pool, hot tub, and patio with lounge chairs. In terms of sports, residents can utilize the community’s two bocce ball courts, horseshoe pits, and planned tennis and pickleball courts. Outdoor lovers also enjoy the miles of walking trails in addition to a community garden. There’s something for every resident of Jubilee at Los Lunas, whether it’s fitness classes, sports, holiday parties, card games, or clubs. Some of these include book club, history group, game night, Zumba, open mic night, and monthly seminars. Residents of Jubilee at Los Lunas are granted more time to enjoy these various activities due to the low-maintenance lifestyle provided by their homeowners’ association (HOA). The HOA provides outdoor maintenance, including lawn mowing, trimming, and irrigation. Another important aspect of Jubilee at Los Lunas’ lifestyle is the climate of the city of Los Lunas, which provides residents with over 300 days of sunshine a year and makes it easy to enjoy the various outdoor amenities at the community. Besides the weather, the community’s location in Los Lunas means homeowners are only a short walk away from the area’s restaurants, shops, and theaters. Just down the street from the community is a Walmart, The Home Depot, and Starlight Cinemas. Also in walking distance are several parks and scenic views of the immense Rio Grande River. Residents of Jubilee at Los Lunas also love being minutes away from Interstate 25. From there, downtown Albuquerque is only a 20-minute drive to the north. Albuquerque is a thriving city with scenic Southwestern backdrops and an active cultural scene that includes art festivals, museums, and art galleries. Yearly festivals such as the Albuquerque International Balloon Fiesta, the New Mexico Wine Festival, and the Rio Grande Arts & Crafts Festival provide exciting entertainment throughout the summer. The region is home to some of the most historic, continually established settlements in North America. Only an hour and a half away is Santa Fe, which is also home to an exciting social scene, trend-setting restaurants, and an endless array of famed galleries and museums. Jubilee at Los Lunas combines an ideal location with unmatched amenities to create one of the most desirable 55+ communities in New Mexico.